Jen and Reg Mattingley have been running a wildlife shelter in Maryknoll Victoria for the past twenty five years. Their specialty has been in the Care and releasing of wombats. This website is a resourse for Wildlife carers with many of the issues you will come across during your care of wombats. The whole reason is to give the animals a second chance getting them back into the wild.There will be a lot of heartache along the way, with many difficult decisions to make. Right from the word go we should be aware that these animals are not pets. Do not imprint, you will jeopardise their lives. Wombats will be in care until they are 2 years old and approx. 25kgs. Wombats are difficult animals to handle when they are 20-25kgs, the recommended weight for release. Make sure you have all the correct details before you leave home so you can take the right equipment. When ever possible work in pairs. Or make sure there will be someone there to help. Try to block all escape routes. Once you have caught the wombat cover the cage to minimize stress. * Check rescue equipment before leaving – fluro vest, torch, scissors, rubber gloves, heat pack, pouch, carry cage, towels and a couple of large blankets. * One large blanket folded into quarter can be used as a stretcher. The other for covering and securing the wombat. 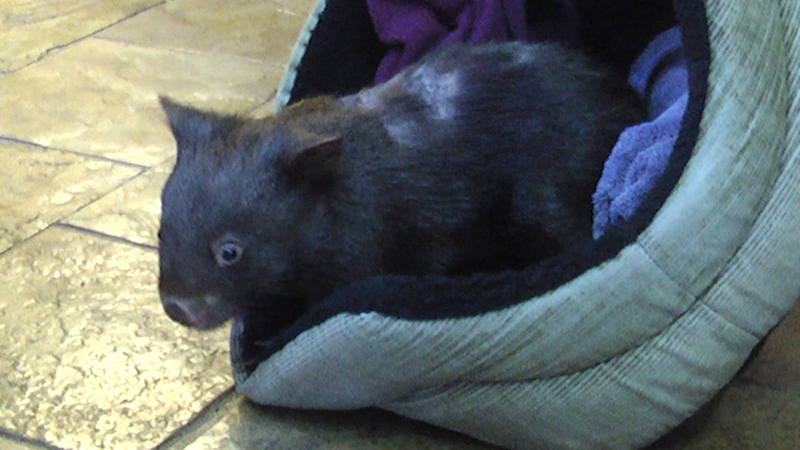 * Rolled up towels can be used to support and stop the injured wombat from rolling around during transport. * If possible check if the wombat is male or female. * If there is a joey in the pouch you will need to place mum on her side and support her with blankets and towels so she doesn’t roll and squash the joey. * Sometimes it isn’t necessary to transport in a cage. * Assess the situation. Try to avoid unnecessary pain and trauma. * Ring the vets before hand so they will be prepared.